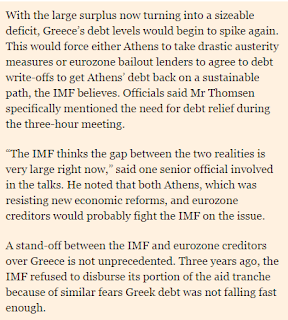 Are The IMF and the EU at Loggerheads Over Greece? Everything has a cost, or so the story goes, especially time. In the Greek case we now know an additional item on the mounting bill: the country is back in recession. The issue is who - apart of course from the long-suffering Greeks themselves - will pay the extra costs of the latest imbroglio. It is now clear that Greece's economy has been going backwards over the last 6 months, and that it has once more fallen back into recession. 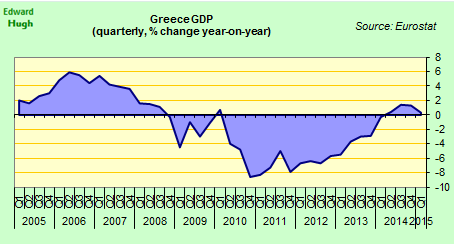 Greek GDP fell by 0.4% in the last three month of 2014, and by a further 0.2% in the Jan - March 2015 period. As a result at the end of March Greek GDP was only 0.3% above the year-earlier level. This is a lot lower than expected in IMF forecasts, and - perhaps more importantly - well out of line with what is needed to maintain the 2022 debt sustainability targets on which continuing Fund support for Greek programmes depends. Indeed "Greece is so far off course on its €172bn bailout programme that it faces losing vital International Monetary Fund support unless European lenders write off significant amounts of its sovereign debt", Peter Spiegel wrote in the Financial Times on 4 May 2015. The reason for this is obvious: IMF regulations prevent the Fund continuing to make tranche payments to countries where there is a foreseeable financing shortfall during in the coming twelve months. The worsening in the Greek economic outlook and the consequent reduction in the revenue outlook effectively guarantee this shortfall. 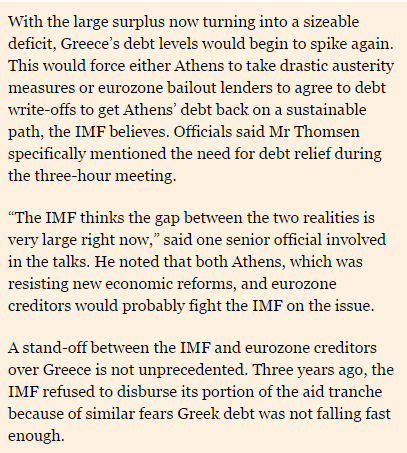 But the sort of debt write-off the IMF is demanding of its European partners goes much deeper than that. 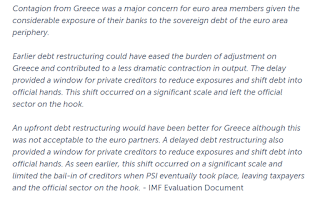 Future IMF participation in any new Greek programme after June is also in doubt because without additional pardoning the debt will not be on a sustainable trajectory in terms of the objectives set down and agreed upon in November 2012. So you reach a point where extend and pretend hits the proverbial fan. You can, of course, do more extend and pretend till the next time it happens, but at this point the IMF seems reluctant to do so. On the other hand austerity-type spending cuts which only make the economy smaller and the growth path lower simply don't help in this context, since what they give with one hand (debt reduction) they take away with the other (in the form of lower GDP). The background to the current stand-off is to be found in the debt targets the Eurogroup agreed with the IMF in November 2012 and which effectively made the current programme possible. Given the latest recession these targets are clearly now not attainable. On the other hand Greece is totally bust, so the only way the negative effects of the negotiating gridlock can be paid for is by someone else "coughing up" (or rather "pardoning" debt). This someone will need to be the Euro partners (who else is there), and the longer the stand-off goes on the higher the cost. Naturally the other alternative would be allowing Grexit, but arguably the cost of Grexit would be much higher to the Euro partners, and by a large multiple. The issue of the growing IMF/Eurogroup divergence came to general public attention over the weekend when an IMF internal memo was leaked to Channel 4 News (UK). 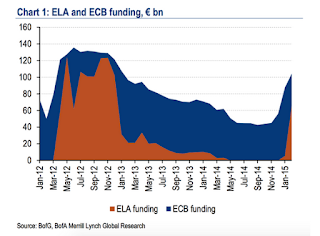 The key point in the memo, which is hardly news, is that Greece is running out of money. “There will be no possibility for the Greek authorities to repay the whole amount unless an agreement is reached with international partners," referring to a series of June repayments to the IMF amounting to roughly 1.5 billion euros. 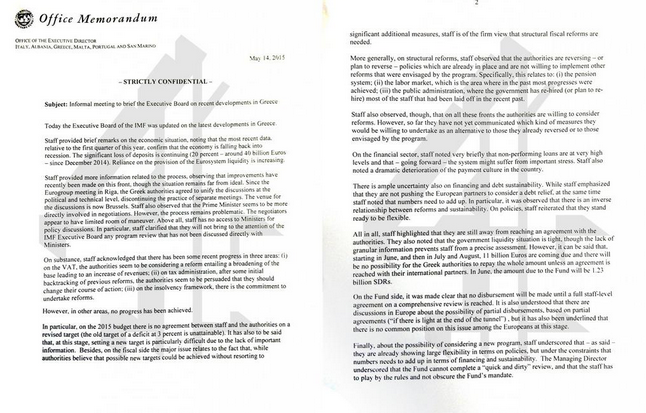 This impression is also confirmed by details of the letter that the Greek Prime Minister Alexis Tsipras wrote to International Monetary Fund Managing Director Christine Lagarde at the start of May (see details in this Kathimerini article) to inform her that Athens would not be able to pay the 750 million euros due to the Fund on May 12 unless the European Central Bank allowed Greece to issue more T-bills. 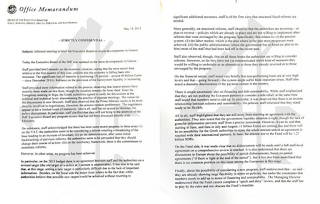 It appears that at the time of writing the letter (which also went to EU Commission President Jean-Claude Junker and ECB President Mario Draghi) Mr Tsipras was not aware he could temporarily use the 650 million euros held on reserve at the Fund to make the payment, which he subsequently did. It's not unreasonable to assume that it was the IMF itself who advised him on this. The inter-institutional tensions are evidently reaching a critical stage, although in fact the issue has now been knocking around for some weeks, as Simon Nixon reported in the WSJ on April 22.The IMF, he said, "appears to have blinked". The general impression being given is that the IMF is contemplating a much lower bar for agreement, and then possibly disengagement from any post June programme. The Euro partners are evidently anxious to avoid this outcome, but they are caught between a rock and a hard place. On Or Off The Hook? The macroeconomic outlook, debt service to the Fund, and peak access remain broadly unchanged and euro area member states remain committed to an official support package that will help keep debt on the programmed path as long as Greece adheres to program policies. Capacity to repay the Fund thus depends on the authorities’ ability to fully implement an ambitious program. It continues to be the case that if the program went irretrievably off-track and euro area member states did not continue to support Greece, capacity to repay the Fund would likely be insufficient. Now all of this may sound - at least to the uninitiated - like a load of old bureaucratic mumbo-jumbo, but actually there are a number of key statements here which may help to put the current internal Troika tiff in some sort of broader and more intelligible perspective. The cited paragraph talks about three issues: the macroeconomic outlook, the commitment of euro area member states to support Greece and keep the debt on the programmed path as long as Greece adheres to the programme's requirements. It also warns of the danger that should the programme go "irretrievably off track", and euro area member states not give the necessary support then the country's capacity to repay the Fund would clearly be insufficient - ie the IMF would be left holding the can, and Fund employees would be faced with the complicated task of explaining to its non-European members why losses had been incurred. Crudely put the position is this - as long as the IMF continue to write reviews stating the Greek programme is on track then the euro area member states are on the hook to cover any shortfall in Greek debt performance in order to make the 2020 and 2022 targets (see above) achievable. This is a commitment they undertook during negotiations on the second bailout agreement. On the other hand, if the IMF were to start producing reports stating that the programme was off-track because of Greek non-compliance, rather than for example arguing that the numbers were out of whack due to faulty macroeconomic forecasts (and of course the recent economic relapse makes those forecasts even less realistic), then the euro area member states would be off the hook from additional stepping up to the plate with the result that the IMF would end-up taking a loss. Well the present recession makes it evident that those targets are even less achievable than they were previously, and that future debt sustainability analyses will have to reflect this. Bottom line: the IMF has a clear interest in enabling Greece to sign successfully off the current programme (due to end in 2016) and they thus have more interest in giving the country a "pass" note than the Eurogroup ministers do.This is why, in Simon Nixon's words, they are blinking, to the great discomfort of the Eurogroup partners. A lot of attention is being paid at the moment to the idea that Greece is running out of money, and indeed there is a lot of chuckling about just how much grasp Yannis Varoufakis actually has of game theory. But at the end of the day it is also true that when you have lost everything (in the bankruptcy sense) you have relatively little still to lose. 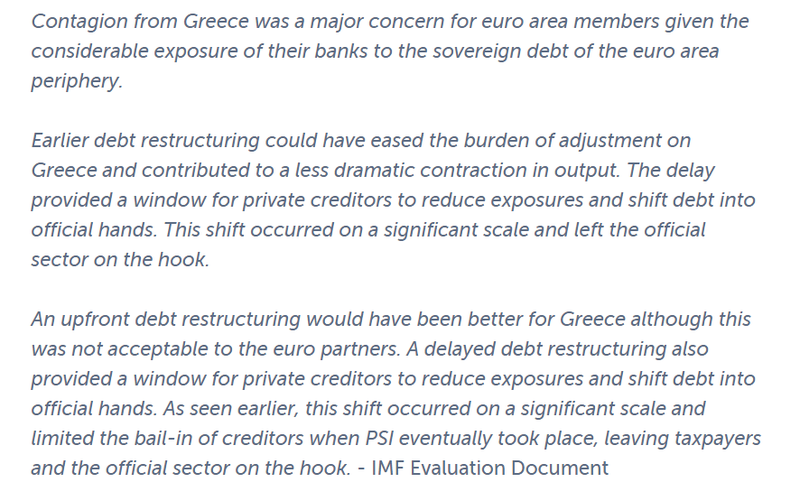 To some extent the idea that the Greek government might be deploying this strategy - known technically as coercive deficiency - was explored by Jacques Sapir back in February. In my humble opinion far too much energy may have been wasted on laughing at Mr Varoufakis (which might precisely have been his intention) and far too little invested in trying to think through what he might have been up to. If delays in negotiations mean a large bill is run up on your credit card (figuratively speaking) at the end of the day you can't pay it, so someone else will have to. 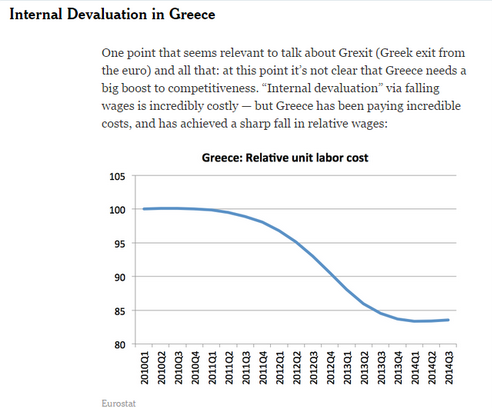 This is the situation Greece is now in. If non performing loans start to rise with the new recession eventually these will have to be written off, and the bank recapitalization costs will go on someone else's account. The IMF memo in fact draws attention to this issue, and states that “non-performing loans are at very high levels and – going forward – the system might suffer from important stress." Indeed they go further and point out how "staff also noted a dramatic deterioration in the payment culture in the country”. This is what you would expect to find in a country steadily, and day by day, going bankrupt. It's no longer clear that even if progress was made in the next two weeks towards some sort of fudged compromise deal - the so called "quick and dirty outcome" that the IMF oppose - that this would be able to get the necessary agreement from all EU parties and the IMF before the June payment. That is not necessarily an insurmountable issue, but it does highlight just how near to a potential brink (or "accident") we are, and it also serves to draw attention to the point that the longer all this goes on the greater the cost for Eurogroup members. Reforms will bring a bit more growth, but only in the longer run. Whatever the package of structural reforms the Greeks sign on to it won't do that much to mitigate the effects of the hit the Greek debt sustainability profile just took. But then there is the other alternative - just allow the momentum of the present impasse to carry Greece straight out of the Euro Area. That would solve the problem of getting a deal, but the cost, when you come to think of EFSF and IMF loans plus ELA would hardly be negligible, not to mention the as yet unquantified geopolitical and contagion effects. Whatever way you look at it, the next few weeks are certainly likely to be interesting. The above arguments are developed in much more detail in the recently revised version of my book "Is The Euro Crisis Really Over? - will doing whatever it takes be enough" - on sale in various formats - including Kindle - at Amazon. One of the more intriguing aspects of the whole modern Greek drama is the tragicomic way the country seems to be constantly condemned to live out well known themes which come from its own mythology. The latest example is the way what was once the cradle of European civilization has allowed itself to be converted into the role model for everything its fellow Europeans are not. Or at least, this is the story we are supposed to believe. Greek culture and historiography is replete with references to a figure - the pharmakos, or scapegoat – who needed to die that others might live. In fact, the pharmakos ritual is probably as old as human experience itself. In classical Greece it was the custom in times of crisis for some poor unfortunate to be singled out to serve as a whipping boy, the one whose chastisement served to make the wounded demos whole. The unlucky victim, according to the texts, was first beaten with fig branches, and then ceremonially led through the assembled community to receive a bout of verbal abuse prior to the execution of sentence, which invariably meant being either sacrificially killed or permanently banished. The whole process has normally been interpreted by anthropologists as the means of purifying the group of some kind of perceived pollution, some sort of plague or great misfortune which has inexplicably befallen them. The source of the evil is first accumulated in the victim - the scapegoat - who is then sacrificed in order that it may in this way be extirpated and the city cleansed. According to the nineteenth century British classicist Jane Harrison the pharmakos was viewed as an “infected horror”, even to the extent that the kindest thing might be “to put an end to a life which was worse than death”. The resonance of all this with the recent history of the Euro Area should not be hard to discern. 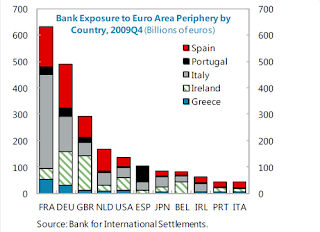 For many Greece has come to incarnate all that is bad within the monetary union. Due to its own laxness it has been transformed into the rotten apple that endangers the rest of the barrel. It needs to be set apart, if need be even expelled. Hypocritically or otherwise some even go so far as to suggest it would be in the country’s best interest to meet this fate, to have Grexit forced on it as an act of kindness, in a way which is all too reminiscent of the arguments used to justify terminating the scapegoat’s suffering . Such a life was, after all, "worse than death". The line in the sand that has been drawn around the country is slowly but surely becoming an impermeable frontier. The logical step for the country to take now is "capital controls", or so we often hear, as if such a measure were to help the country remain inside the currency whereas in reality it is the obvious stepping stone on the road to exit. Extraordinarily those who are most praised for being "not like Greece" often turn out, on inspection, to be only milder versions of the same. 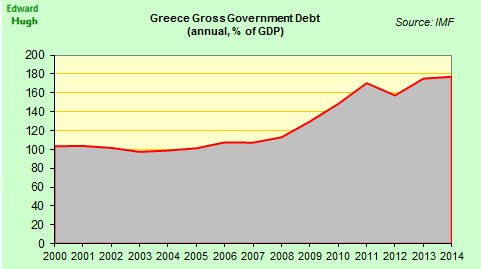 They have debts which are almost as unsustainable as the Greek one (Italy or Portugal), they run far higher fiscal deficits (Spain), they need more labour and pension reforms just like Greece, and without doing more are surely stuck in similar kinds of “growth traps”. Yet far from the others being subjected to harsh austerity and pressure for “tough love” reforms, they are big beneficiaries – without any kind of conditionality – of central bank bond purchases, a backstop for guaranteeing ultra-low interest rates and the kind of market access from which the transgressor country remains frustratingly cut off from. Given that Greece is so obviously the weakest member of the group, what kind of bizarre logic leads the EU’s leaders to impose the most difficult of conditions, especially given how much is at stake for all of us? Looked at from a suitable distance it isn’t that hard to argue that if Greece hadn’t existed it would probably have been necessary to invent it. Amongst so many squabbling parties Greece’s presence has served to unite, to let the others know who they are by enabling them to say who they are not. Whatever his shortcomings, the fact that Finance Minister Varoufakis found himself in an 18 to 1 minority in Riga speaks volumes: Greece is the tie that binds. So Greece has suffered greatly so that Europe might save itself. And this has now happened twice. The first occasion was when the country’s debt was consciously not restructured in 2010, provoking an impossible fiscal adjustment which was inevitably followed by an ultra-deep recession. This decision, as is often noted, allowed Europe’s banks to be saved, while at the same all the other struggling countries had their economies talked up, simply on the basis of their not being "Greece". Indeed the much vaunted European Banking Union is very much a by-product of the Greek travails, as was Draghi’s currency-saving promise. Without the threat of contagion from Greece to support the case for it would this have ever been made? And now, before our eyes, history is being repeated. The second time is just as much a tragedy as the first one was. Greece is being starved of cash, while everyone else is receiving substantial debt support and enjoying seeing their interest payments reduced to extraordinarily low levels by ECB QE bond buying. Fiscal deficits targets in countries like France, Spain, Italy and Portugal have been relaxed, and in any event no longer attract the investor attention they once did. Everyone wants to ride the Draghi wave, not push back against him. And how exactly was QE pushed so easily through an otherwise deeply divided ECB governing council? It couldn't possibly be because those who were most opposed to it were also those most in favour of forcing Grexit, could it? Could there have been some kind of "unholy alliance" between hawks and doves at the central bank since QE put in place the essential "cordon sanitaire" firewall, even while many were busy denying there was any real deflation risk. Naturally it is the presence of this QE firewall which would be absolutely essential to the existential well-being of the common currency should the worst come to pass in negotiations with the new Greek government. How can it be, at the end of the day, that those who are deemed strongest get most support, while those who are weakest are left exposed – like frail babies in a world long past – to wolves and inclement weather, just to test if they are strong enough to survive before being fed? It would have been better for Greece since it would have enabled the IMF to lend over a longer period, which would have meant that the rate of reduction in the fiscal deficit could have been slower. 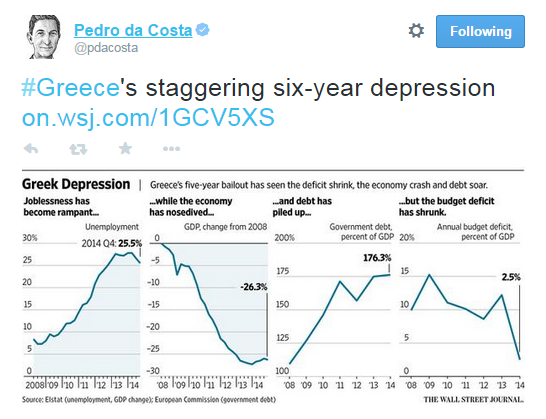 In plain language the austerity applied would have been less severe, and the economic adjustment more manageable. This is the philosophy being pursued at the present time with the Spanish and French deficits. These two countries are being given longer to bring the overspend down below the critical 3% of GDP stipulated in the Maastricht Treaty, and there is a consensus that this is a good thing. So a programme where there were serious doubts about long term debt sustainability was adopted due to the risk of contagion elsewhere in the Eurozone. 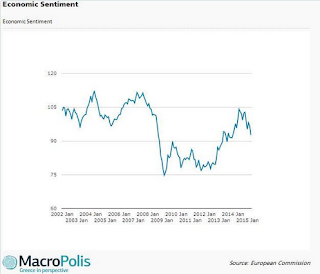 The result was that Greece's correction had to be carried out more quickly (or an attempt had to be made to do so) resulting in a much steeper than absolutely essential recession. This way of doing things is not desirable, but even less desirable is to do it, and then fail to accept responsibility for having done so. The objective of the line of argument being laid out here is not to support the world view of Syriza or the current Greek government, rather it is to suggest that mistakes made earlier are what has produced a climate in which Syriza-type arguments prosper. Simply to blame the Greeks for this is a travesty. Europe's leaders need to look beyond the current Greek government, and think about the long term interests of the Greeks themselves. Starving the Greek government of cash and crashing the economic recovery - which will only foment more radicalism later - is not the way to do things. 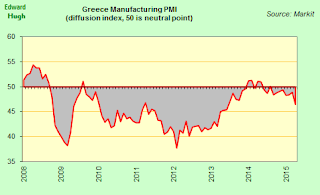 How Serious Is Recession Risk Now In Greece? Getting hard data on Greek economic performance since February is still difficult, since all the important developments are far too recent. However, what information we do have all points in the direction of serious weakening in the economy. Economic sentiment has been falling in recent months, and April's drop was particularly pronounced. The economy contracted in the last three months of last year, and it has surely contracted again in the first three months of this one, making a new recession well nigh a certainty. The Greek Parliament Budget Office declared at the end of April that in its opinion Greece was at risk of a new recession. 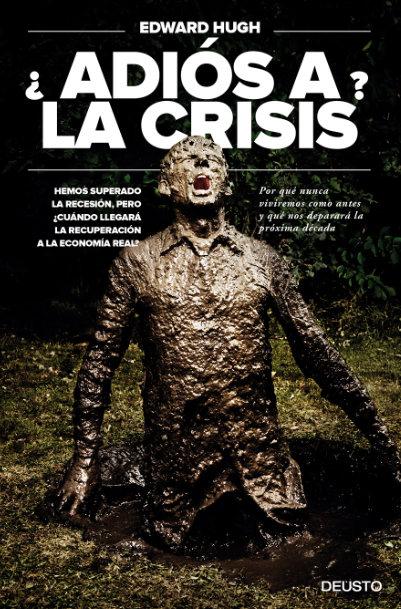 “An agreement with creditors is urgent because the country is in danger of falling into deep recession and the government’s lack of strategy harms the economy”, they say in their latest quarterly report. In fact the economy is almost certainly relapsing and has been in a recessionary trajectory since the last quarter of 2014. 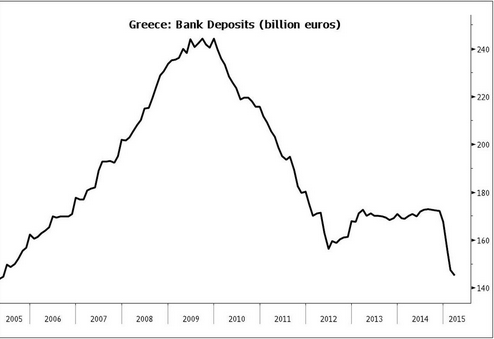 Bank deposits have dropped by 26 billion euros since then and outstanding debts to the state have risen by almost 3.5 billion euros in the first quarter of 2015. Most businesses are having serious financial problems and huge difficulties with foreign suppliers and clients. Non-performing loans are increasing and the retail sector is suffering, while new investments are almost non-existent. The economy has reached a point where even healthy businesses are in danger, the report says. Some evidence to back this view has also come from the Greek Commercial Register which reported a 21.8% annual drop in new business creation in the first three months of the year. As the Parliament budget office notes, the economy is starting to suffer from a shortage of cash and liquidity. 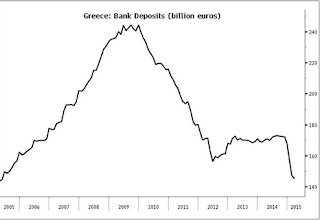 The banks have suffered a severe deposit loss, and although much of this is covered by emergency liquidity assistance (ELA) obtained via the ECB the fact of the matter is people will be holding on to their hard currency Euros just in case Grexit occurs. This in itself slows activity down. But in addition the Greek government itself is short of cash, which means it is not paying suppliers punctually, if at all. Those suppliers then need short term working capital loans from banks who themselves are short on capital, and so on. Basically the economy is suffering a severe cash and credit crunch and it is hard to see how this won't have a severe negative effect on economic activity. The lasts EU Greece forecasts recognizes this state of affairs, and lowers the 2015 GDP growth forecast from 2.5% to 0.5%. More ominously it also raised the debt outlook for this year from 170.2% of GDP to 180.2%. 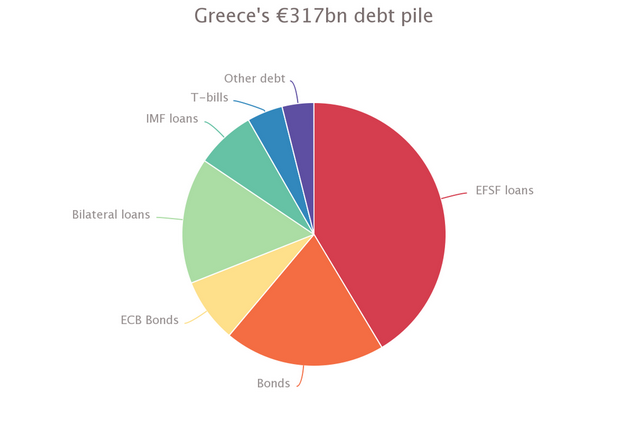 Since Greece is effectively bankrupt this inevitably means more debt pardoning from the country’s Euro Area partners if it is to remain in monetary union. A point which is picked up by the IMF in signs of growing tensions within the Troika itself over how things are being handled. Under existing bailout targets, Athens was supposed to run a primary surplus — government receipts net of spending, excluding interest payments on sovereign debt — of 3 per cent of GDP in 2015. But according to the Financial Times, the IMF Greek representatives Poul Thomsen told EU Finance Ministers in Riga that initial data showed Athens was on track to run a primary budget deficit of as much as 1.5 per cent of gross domestic product this year. The question is, what will be the longer term political consequence of crashing the economy again? 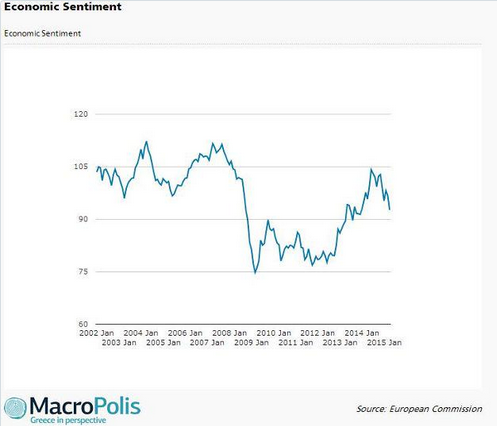 The sharp growth in support for Syriza over the last couple of years can be seen as the one of the side effects of an overly deep recession/depression. Sending the Greek economy down further is only going to complicate the political scene even more, and make finding consensus even more difficult. Too much EU policy emphasis has been placed on "defeating" Syriza, rather than securing the long term stability of Greece, and its people. Too many EU politicians have even been playing games, using the specter of Syriza to fight domestic populism at home. Naturally the cases of Spain and Portugal come immediately to mind. But does this lack of flexibility serve the long term interest of Europe? Greece's problems are still long term, and can't all be resolved in negotiations between now and June. Releasing bailout money to pay the IMF and the ECB - or rather paying it direct - would have made sense, using these payments as a way of pressuring Syriza by strangling the Greek economy doesn't. While growth returned in 2014, it was very modest growth in relation to the fall which preceded it. In addition the country's economy is still suffering from deflation, with consumer prices falling by 1.9% in March over a year earlier, the 24th consecutive month of negative inflation. What the country needs from the EU and the IMF is not a bed of nails, but rather support in moving the economy back onto the path of stronger growth momentum. Rather than treating the country as a scapegoat, as an example of what not to do, Greece badly needs the kind of positive support Portugal, Italy and Spain have been receiving in order to start to attract some constructive investment. All have to serve, but not all are being forced to serve as an example. What is needed is not a lesson in morality - from either side - but some plain old fashioned pragmatism. 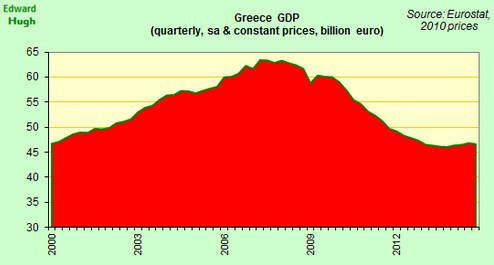 If Greek GDP really does constitute a negligible part of Euro Area GDP where's the big deal? Do US politicians make such a fuss about states like Alabama, or similar? It's in everyone's best interest, and you know it makes sense. 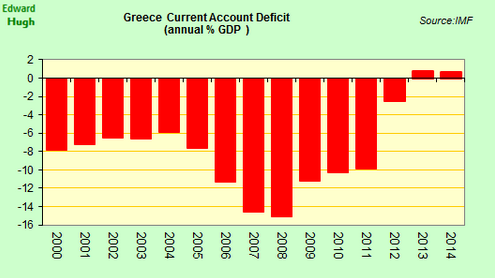 Greece has already made a very substantial adjustment to its fiscal and external balances. On the fiscal side Paul Krugman estimates it amounts to around 20% of GDP between spending cuts and tax hikes. What a pity if for want of the final nail the whole kingdom were to fall. Greece's has now lost less competitiveness than Finland since the year 2000. This doesn't mean that the one is more competitive than the other, Finland was a lot more competitive at the turn of the century, but it does suggest that the country has made a lot more progress than the anti-Syriza bias in statements on Greece is giving its citizens credit for at the moment. Naturally the country "cheated" on its partners, and sacrifices were inevitable but surely a more pragmatic and equitable solution could have been found. Simply punishing a country for what is perceived to have been "wrong doing" on the part of its elected representatives accomplishes little and may put a great deal at risk, including amongst those not directly involved. 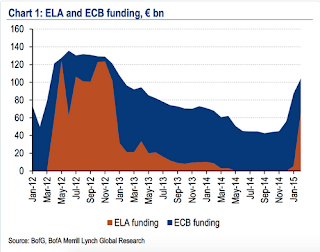 When Will The ECB Start To Taper? 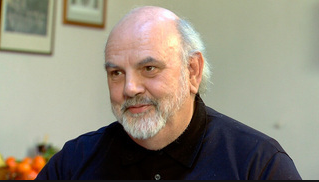 Edward 'the bonobo' is a Catalan economist of British extraction based in Barcelona. By inclination he is a macro economist, but his obsession with trying to understand the economic impact of demographic changes has often taken him far from home, off and away from the more tranquil and placid pastures of the dismal science, into the bracken and thicket of demography, anthropology, biology, sociology and systems theory. All of which has lead him to ask himself whether Thomas Wolfe was not in fact right when he asserted that the fact of the matter is "you can never go home again". He is currently working on a book with the provisional working title "Population, the Ultimate Non-renewable Resource". 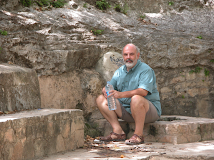 Apart from his participation in A Fistful of Euros, Edward also writes regularly for the demography blog Demography Matters. He also contributes to the Indian Economy blog . His personal weblog is Bonobo Land . 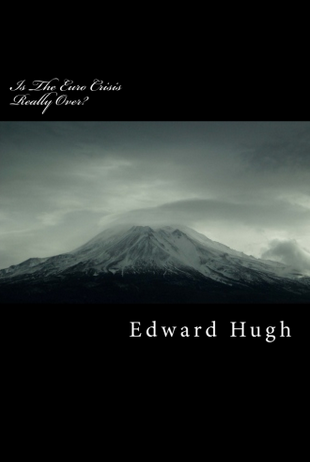 Edward's website can be found at EdwardHugh.net.